Why use NY Yacht and Boat Charter? NY Yacht & Boat Charter has one of the best reputations of service and integrity in New York. We match the needs of every client who walks through our door. There's no need to shop around. With us you get extra service for no additional cost. We've set up our website as a virtual brochure of yachts based on guest count and yacht size to make it simple. After you've browsed through, PLEASE CALL US at 1-888-755-2628. Whether it's a Wedding Cruise out of NYC or New Jersey, a New York Harbor Corporate Yacht Charter, Bar/Bat Mitzvah, Special Birthday Celebration, Fundraiser, College Graduation, or Sweet 16, chartering a private yacht is exciting and memorable. We take care of the event planning so you can enjoy your event. We love New York. 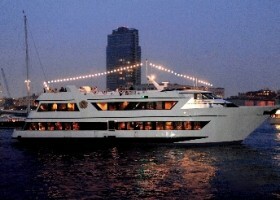 Experiencing the New York Harbor on a private boat is magical. We want you to enjoy it just as much as we do! NY Boat Charter began in 1998 by Capt. Rob Bellanich. He took couples and small parties up to 6 guests out on his boat he named Risk It All (now Bliss). Capt. Rob met singer/songwriter Lezlee Peterzell in the summer of 1999, and his business was growing rapidly. Growing up on boats and having experience in the corporate and entertainment world, Lezlee helped Capt. Rob market the business while he helped her with her singing career (see www.lezlee.com). They fell in love. While she was touring Europe, Capt. Rob proposed to Lezlee onstage in Prague, Czech. Republic and a year later, they were married. Demand for larger parties suddenly grew. 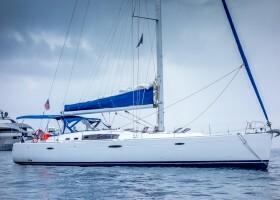 Rob encouraged Lezlee to book larger parties on other yachts. She began NY Yacht Charter in 2001, and booked charters for corporate events, weddings, and private parties. Having booked and coordinated numerous weddings, Lezlee obtained her Priestess License to conduct Marriage Ceremonies. .